I am sickened by recent news. As you all know, I choose to stay as far away from politics as I can on Theresa's Haunted History. However, our West Virginia legislature has made that impossible this term. 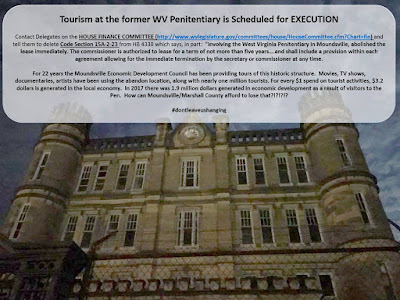 Not only have bills been introduced that would allow commercial logging to destroy the history and natural beauty of our state parks, but now, they're attacking tourism at the West Virginia State Penitentiary in Moundsville! Back when the prison shut down in 1995, it could have easily taken on the same fate as so many other old buildings. It could have been left just an empty hull in the middle of Moundsville, waiting for vandals and the elements to finish it off. However, it was saved from that fate when a group of citizens under the name of the Moundsville Economic Development Council secured a lease for the property. That lease was renewed in 2004, and under its provisions, would have lasted through 2029. However, a small clause was found embedded in House Bill 43-28. 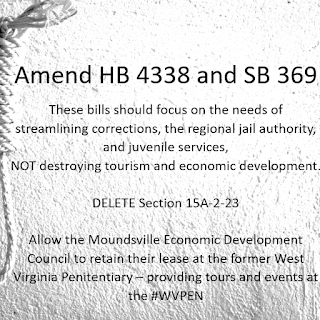 So, our lawmaker are planning on using a bill, which is otherwise a good thing, to shut down tourism at the West Virginia State Penitentiary at Moundsville. The bill is currently for review with the House Finance Committee. What I need for every one of you reading this is to share, share, share! Get this information out to the citizens of West Virginia and to the paranormal research community! Follow the WV State Pen on Facebook for updates and easily shareable information. More importantly, I need you to make calls/send emails to members of the House Finance Committee and your local representatives and/or Governor Justice and let them know that we will not let them take this community asset away from us. As a paranormal investigator and researcher, the West Virginia State Penitentiary holds a special place in my heart. They offer both private and public ghost hunts, which are top-notch. If you're not ready to go for a full investigation, you can choose a shortened version. There are also various guided tours available, usually given by a former CO of the prison! These history tours are outstanding. For an extremely reasonable price, you get an excellent look at the prison, a comprehensive overview of its history, and a peek at what life was like for inmates and staff alike. These tours are not only educational, but they're FUN, and each guide has his/her own personality and spin on things so each tour is a little different and can be tailored to the group's interests. 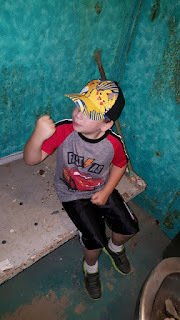 I have an 8 year old son who has already learned so much about local history, social history, and the history of corrections in general, and its all because of the WV State Penitentiary. But the old prison offers so much more! Television shows and movies often use the location for filming. During the Halloween season, they offer a top-notch haunted dungeon attraction. When Escape Rooms started emerging on the scene, they added that element as well! People rent out areas of the property for parties, weddings, and other festivities. Community events are held, including plenty of family-friendly and kid-oriented entertainment. Like many visitors, some who come from out of state and even out of country to visit the prison, we tend to sink plenty of money into the local economy on our trips to Moundsville! We eat at local restaurants and stay at local hotels. We purchase fuel from local gas stations and pick up forgotten travel items at local stores. And of course, we make sure to take home plenty of souvenirs from the prison's gift shop! But that's still not all! We visit other local attractions while in the area! If we weren't drawn to the area to see the prison, we'd probably never stop in across the street and see the burial mound and its museum (and spend money in THEIR gift shop as well!). We might not have visited the Golden Palace, or the former Castle Halloween Museum, or any of the great locations of historical interest in the Wheeling area. For over 100 years, the West Virginia State Penitentiary did its job housing the state's worst offenders. It was seen a place of violence, a place of sickness, a piece of dark, yet necessary history. Now, it has the opportunity to educate, to entertain, and to provide a safe place for the community to come together. Don't let a few lines stuck in a bill destroy that legacy.